Choosing a “Life Without Limits” in Gardens at Verde Vista is about more than just a new home and neighborhood, it’s about TIME. It’s about finally trading in your old life filled with yard work and household chores for one that’s filled with whatever you love to do most! You’ve worked hard to get where you are, and now it’s time to focus on YOU. What will you do with your time when there are no more limitations? Skip the hassle of building and save over $30,000 on move-in ready homes available now! Every detail of this luxury, low maintenance community is tailored to help you simplify life and discover the blissful freedom of true lock and leave convenience. Full landscape services are provided by the HOA, and every perfectly sized garden home and villa is spacious enough to allow you to live comfortably without the hassle of cleaning a bunch of extra rooms and space you never use. The award-winning, single level garden homes range from 1,600 to 2,000 square feet and start in the low $300’s. Open concept living areas, including a gourmet kitchen, flow harmoniously together to create ideally situated space for entertaining, and an optional 2nd floor with game/media rooms and an additional bedroom and bathroom is available to allow guests a little extra space and privacy during their stay. 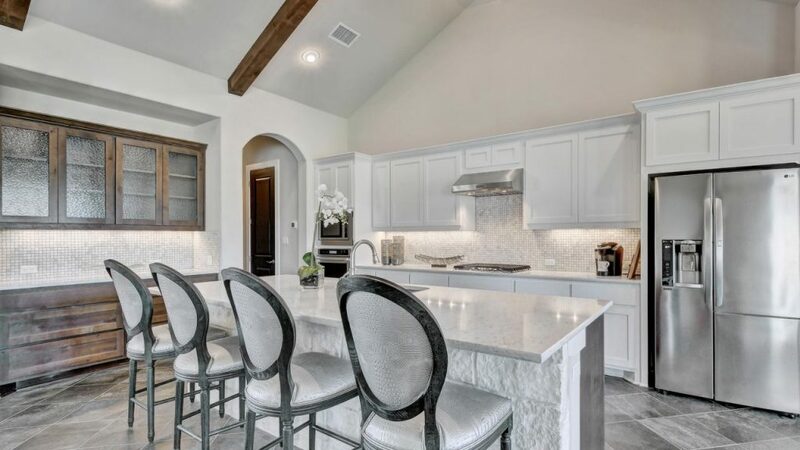 Gourmet kitchens with soaring ceilings and custom finishes showcase the quality built into every home. The single level villas, available exclusively at Gardens at Verde Vista, range from 2,200 to 2,600 square feet and start in the low $400’s. With the same open concept living areas and optional 2nd floor as the garden homes – and just a little extra space to stretch out – the villas also feature a private guest casita with full bathroom and volume/cathedral ceilings with unique accent details. Simplifying your life doesn’t have to mean making sacrifices. 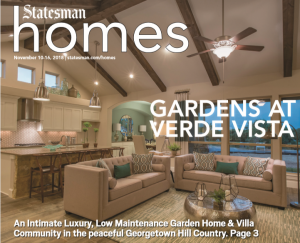 Other builders’ upgrades are the standard at Gardens at Verde Vista, and features like modern Hill Country exteriors, a spa-inspired master bathroom suite, covered patios/porches/breezeways, and luxury custom finishes showcase the quality Spicewood Communities builds into every home. 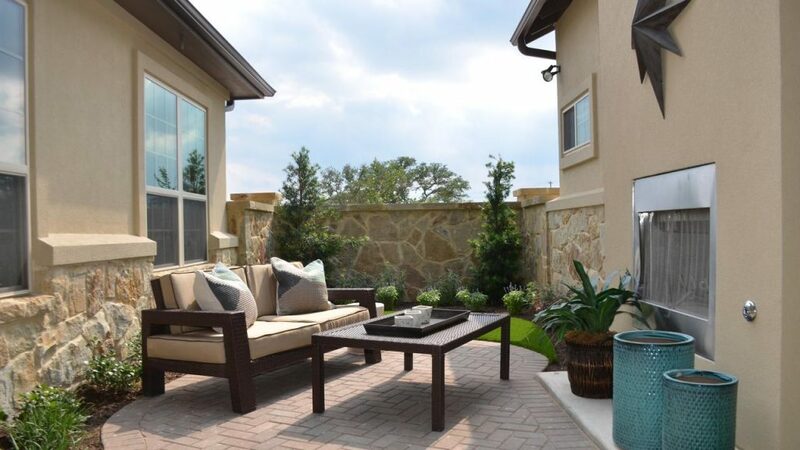 If you need a quiet place to just relax and recharge, Spicewood Communities’ signature gated private courtyard entry, inspired by magical spaces in Tuscany or the French Quarter, creates a serene outdoor sanctuary in every home. Two brand new garden home plans, The Lady Bird and The Zilker, feature a spacious covered patio that takes the outdoor fun and relaxation of the private courtyard to a whole new level! Gated private courtyard entry creates a serene outdoor sanctuary tucked away from neighbors. 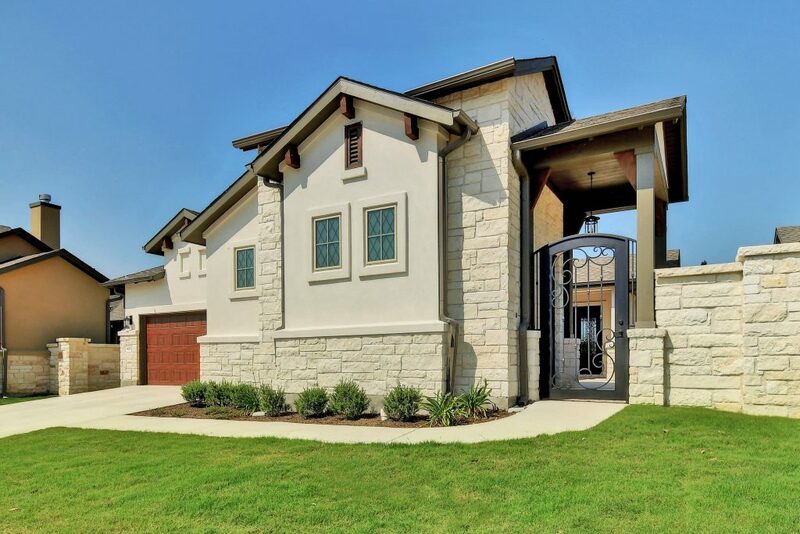 Conveniently located in the peaceful Georgetown Hill Country and limited to only 149 residences, Gardens at Verde Vista is a more intimate community with private amenities and the friendliest neighbors in town. 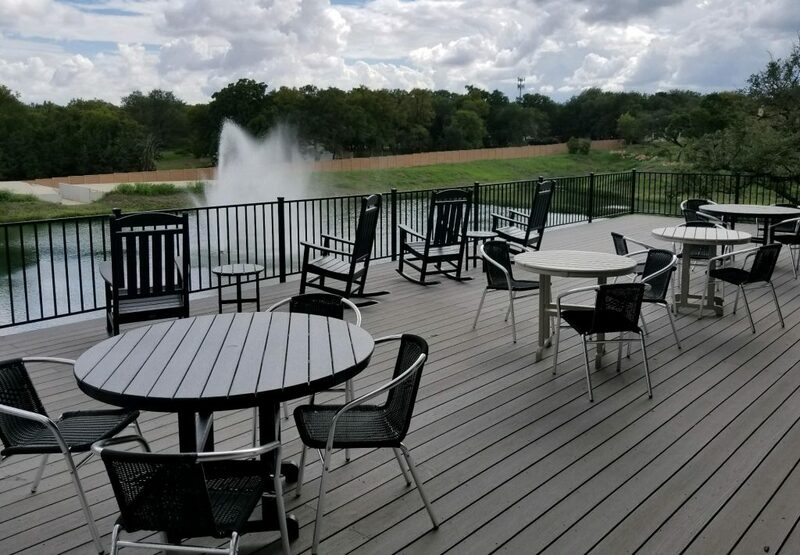 Meet for morning coffee on the deck of the brand new Amenity Center overlooking the community pond and fountain, grab a quick workout in the fitness room, or take a quiet stroll with your “furry friend” along the community walking trail. The new private amenity center features a sprawling elevated deck overlooking the community pond and fountain. “We can’t believe it was this easy to get our Dream Home built by Spicewood Communities. Ms. Lora, Spicewood’s Home Design Coordinator, made our design process painless and FUN. Her expertise and guidance guaranteed results beyond our expectations. We just celebrated our one-year anniversary and could not be happier, pleased and proud of our home, neighbors and neighborhood. With everything taken care of for us, this truly is a lock and leave community!” said Chuck and Evelyn Hickey, current residents. Gardens at Verde Vista’s recently released Final Phase includes limited homesites that will be surrounded by lush greenspace and back to a community pond, and they are currently offering your choice of a free outdoor kitchen or wood floors in main living areas for contracts written in November. Or, if you want to start your new “Life Without Limits” right away, there are also limited opportunities to skip the time and hassle of building and SAVE OVER $30,000 ON AVAILABLE MOVE-IN READY HOMES! For more information, visit www.GardensatVerdeVista.com, call Cristy at 512-863-9999, or just stop by 101 Red Rose Drive, Georgetown, TX 78628.